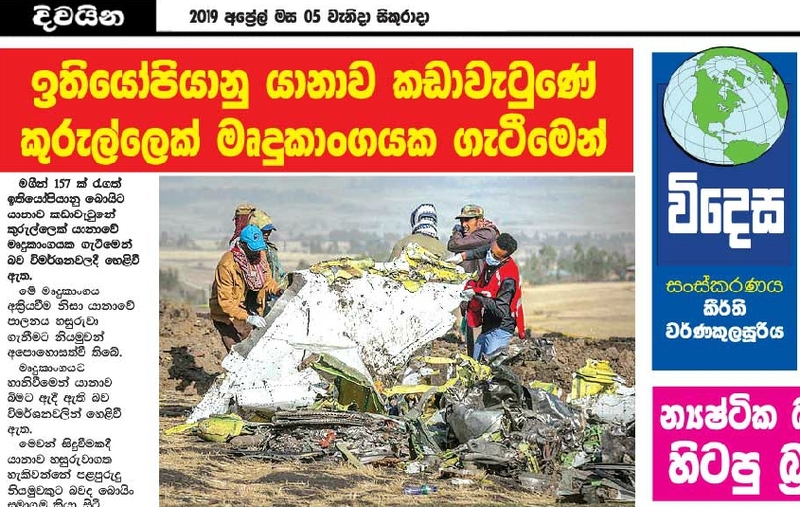 The Island which is a national newspaper has reported today (5) that Ethiopian Boeing 737 Max 8 flight which won acclaim the world over recently and crashed in that manner due to a bird striking it 'software'. 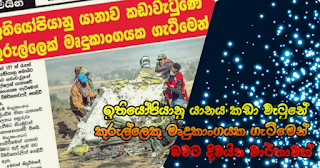 of this software, pilots have been unable to control the plane. The plane has come down because of damage being caused to the software, it was revealed at investigations. Boeing company states that in an incident of this type, it is a competent pilot who is able to control the plane". A dialogue has flared up that this news is something beyond comprehension and that software means a programme installed in a particular computer or accessory and how it can be an object where a bird could strike it's surface. Anyhow, when considering foreign news, this phenomenon has been reported in a different manner. A report of USA Today indicates that in the instance that the latest Boeing 737 Max 8 system when directed to the skies the nose of the plane is automatically makes a turn and that when a bird strikes on the surface on the sensor detecting the direction, the software could get disturbed and the system can receive incorrect messages.